Remember when the room off of our bedroom was going to be my office? I picked a subtle peach and terra-cotta colorblocked design for the walls because I wanted it to be a creative, inspiring space to work. The same week I chose the colors, I also found out we were expecting a baby! With the walls painted and my office furniture in the space, I began to reimagine the room as a nursery. 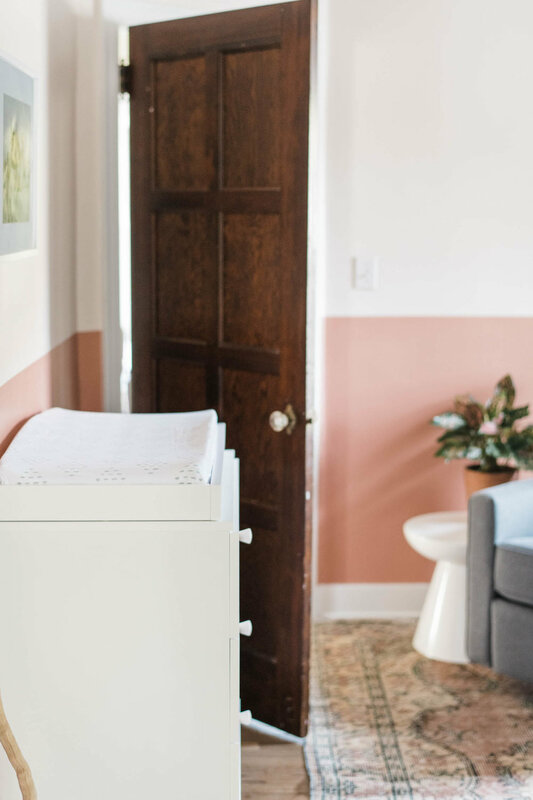 It stayed my office for a few months but slowly and surely it has transformed into a sweet room for our sweet babe without needing to repaint. We took the colorblocked walls as the start of our color palette and overall aesthetic. I wanted the room to feel modern with a tiny touch of nature and a little bit of precious. If you know me or the style I’m drawn to, I don’t really embrace cutesy elements. I’m much more likely to pick up something with pattern created through texture than something printed with bold pattern. The shelf I had in my office was going to stay in the nursery so that helped direct our nursery furniture selections while a vintage rug at a friend’s garage sale pulled together a more cohesive color story with the terra-cotta and peach while introducing a sage green to the mix. Austin’s parents were incredibly generous and offered to buy a crib for us. I pretty quickly found the Babyletto Gelato crib in the natural color and loved that it was made with less toxins than other cribs on the market in its price range, that it had the same coloring as the bookshelf we already had and that it had a modern but not too modern feel. Thankfully, the changing table/dresser in the same collection was on the smaller side which helps in a tiny 9x9’ room. We ordered that and a reclining glider earlier this fall. We’ve been told that nursery things don’t need to be done until after baby comes but we found that as we were collecting clothing, diapers and wipes, having the changing table/dresser sooner than later was going to help with organizing the small things we needed to have in advance while having a glider a few months early has been so nice for nights that heartburn and acid reflux keep me from being able to sleep laying down. The last necessary piece for the nursery was the crib mattress. We’ve tried to balance cost and quality when we’ve been choosing pieces for our little girl. Things that she won’t be in constant contact with can be on the cheaper side but the items like her car seat, the wraps she’s placed in, diapers she wears, and her mattress, we wanted to keep chemicals and off-gases to a minimum. The mattress I found not only is made of air and organic materials and every part of it is washable, the best part about it is that if she rolls over in the night, she’ll still be able to breathe easily through the mattress. Mattresses covered in plastic and filled with dense materials can’t do that. It definitely gives us peace of mind knowing that she’ll be safe in more than one way when she is laid down at night. Just this week we finished more of the nursery off with decor and while there might be more I add or tweak later on, the nursery feels done and checked off. Since we’re 36 weeks along today, it feels really great knowing we don’t have to put it off until months after she’s here. And in a renovation, having another room checked off the list is always a satisfying feeling. It’s a small space but I love that it is right off of our bedroom and that it had enough room for a recliner. It will make late night feedings easier since we don’t have to deal with going far or having to do it sitting in bed which can be hard on my back. We don’t have a theme really in here but lots of cute toys and some of the decor is of animals so it’s fun to have that running through. I couldn’t find a mobile I loved and that matched the color palette so I decided to make one. It took just an hour or two to put together and I really love it. This strand of beads was made by all the ladies that attended my bridal shower. 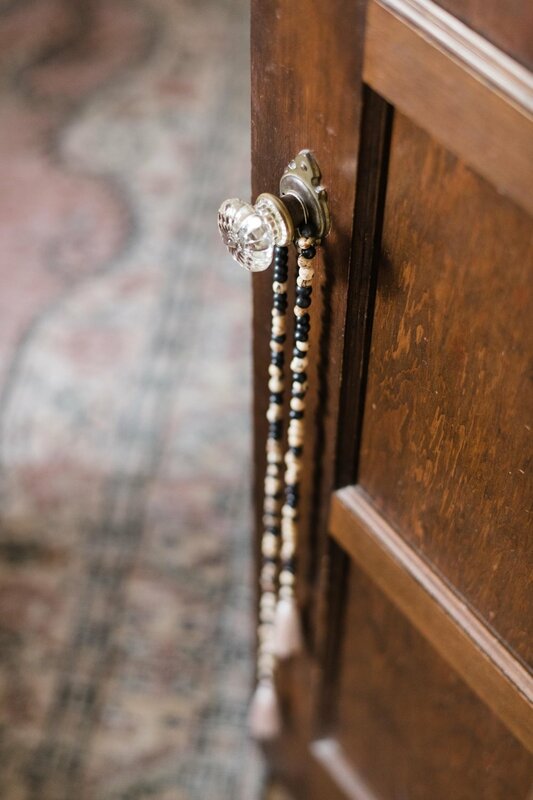 Each went around the room and prayed for me, Austin and our future family while placing beads onto the cord. It’s so pretty and so special. I thought it was fitting to put it on our daughter’s door as a reminder of all the blessings we’ve been given over the years.